Selected Audio Components is an "old friend" of ours. 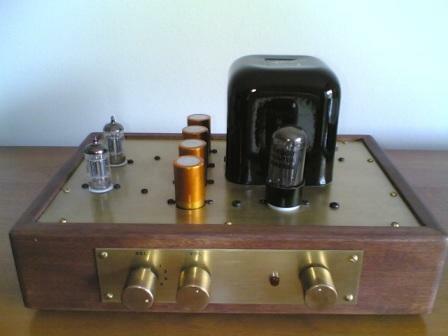 TNT published a review of their Minipre pre-amplifier and Minimono power amp long time ago. While the world has been moving on towards digital amplifications and high resolution media, Selected Audio Components has continued working with tubes, being one of the main supplier of components for valve systems in the Milan area. This new small preamp is one of the latest products they developed. Its simplicity and limited cost makes it a good entry point for whoever is interested in tubes sound without spending too much. The unit is about 300mm wide and 200mm deep. The chassis is made of oiled wood, while the top plate is in brushed brass. It is a small but rather heavy thing, after all, given the huge power transformer. Despite the weight it appears very solid and robust: the top plate must be definitely pretty thick. The front is partially covered by a thick brushed brass panel. Three brass chromed knobs are present on the front plate. 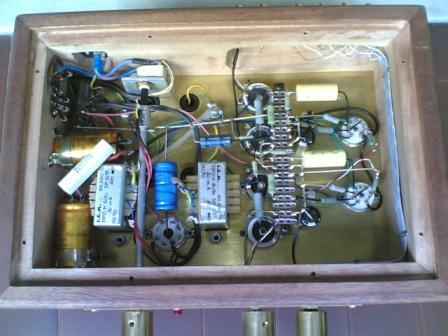 From the right you cand find the power control, implemented as a rotary switch, then the red power pilot light, the volume and the input selector. The back panel is slightly fuller. At the left end you find the power IEC socket, which allows you to move around the unit without any "queue" and to experiment with different power cables. The fuse is integrated in the socket. On the other side there is another thick brass plate with the high quality, insulated, gold-plated input and output connectors. There is both a main output and a tape output, obviously driven in parallel by the front selector knob. The tape output is perhaps the only not strictly necessary feature in this streamlined unit. All the chassis components are interconnected by means of brass screws, whose rounded heads contribute in giving that quot;old style" looks to this unit. The effect is tamed by the black screws used for connecting the electronic components to the top plate. The huge transformer is branded Trau, the brand name of Elettronica Brenta, a well known Italian transformers producer. The high voltage power supply uses a tube for rectification. The output of the rectifier is connected to a relatively small high quality Philips capacitor, in order to keep the current peaks low. From this point on the PSU is separated into two branches, one for each channel. For each channel you find in facts a 100mH inductor, followed by one of the four rectification capacitors, visible on the top of the unit (they are high quality ROE components), then by a resistor and another of the four caps. A rather complicated (CLCRC..), well thought and effective power supply. The heater circuit is rectified too, using this time solid state components. The rectifier output is connected to a simple CRC filter. The circuit is lifted from ground in order to place its reference voltage halfway between the common cathode and common anode triode cathode voltage. In facts each tube implements completely one channel. The audio stage uses two ECC82 EI double triode tubes. They are used in a gain follower setup. The signal from the selector first goes to the grid of a triode in common cathode configuration, which amplifies and inverts the signal. The signal from its anode is then taken to the grid of the second triode, in cathode follower configuration, which just provides for an higher available current ad a low output impedance. The gain is not so low, in facts the cathode of the first triode is bypassed by an electrolytic cap. The Easy Line can also mount two 12AV7, but in this case it would be better to eliminate the cathode bypass circuit to avoid an excessive gain. This is a very simple and effective structure, which I used myself in almost all of my tube pre-amps (including the TNT Preamble), even though it is sometimes criticised because the cathode follower has in facts an intrinsic feedback that fixes its gain to (less then) one. In my view, while the negative effects of global input-output feedback loops are well known and agreed about, the issues here are all to be demonstrated yet, and in any case the benefits in terms of speed and dynamics are far bigger then the problems. Note the construction details: the unit is completely assembled "in air", a very ancient and now uncommon method, which gives the best results in terms of stray capacitances. Obviously, this implies it is assembled manually in all details. As a consequence, it is possible to ask for some kind of customization. Actually, the only one I would suggest, if you have no need for the full gain, is to eliminate the capacitors bypassing the cathode resistor of the first tube. Note also the care which has been taken to keep the low level input signals away from the power supply: the inputs are connected to a flat cable, that you can see running at the extreme right inside the cabinet in the photo above, up to the input selector on the front panel. The major character of the sound of this unit is its musicality. The music flows out easily and the rhythm is very good, and the overall presentation is really involving. The different harmonic lines are correctly portrayed, but at the same time the listener attention is concentrated on the music and not on the instruments. Any similarity with one of the high resolution systems so common and in fashion today is out of discussion: it just seems to listen to a different performance. In a direct comparison with one of these, our pre-amp shows some limitation in the details it can transmit to the user, but on the other side will avoid that unnatural separation of each instrument in its own "music box", with black and silence in between. And without any doubt the result is very appreciable, I would say more musically involving or at least less fatiguing for the brain than with a high resolution unit. The unit is apparently quite neutral. Compared with my reference unit, the colour is however very warm, solar. Low frequencies are relatively extended and tight. Highs are clean, perhaps not too extended, but not edgy at all. Mid frequencies seems slightly favoured compared to the other bands. The overall balance, however, in normal listening, remains definitely neutral. Just a relative issue: with recordings which already have some problem of harshness, mid-highs tend to get a little more strident than I'm used to. By the way, this could be possibly cured simply by eliminating the cathode bypass caps, as suggested above. 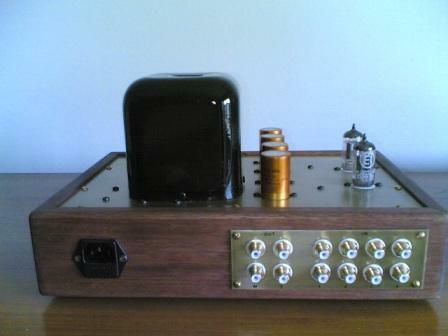 If you are looking for a fashionable, ultra-detailed, ultra-modern, in a word an ultra-ultra-pre-amp, this is not for you. If you are a hard-core audiophile, whose record collection contains only audiophile records, this is not for you either.